Put your visual perception skills to the test with Spot It, a fun, fast-paced, and simple card game that everyone aged 7 years and up can enjoy. In a group of two to eight players, you'll draw cards and match symbols, like light bulbs, snowmen, or puppies, but with one catch--only one matching symbol exists between any two cards. The first person to spot the matching symbol and call it out wins. Fast-Paced Observation Game for the Whole Family! 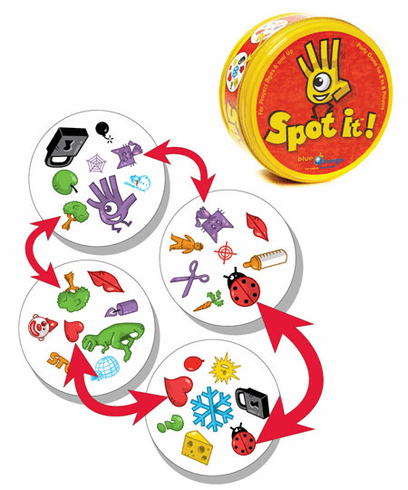 The Spot It game consists of 55 circular cards, each decorated with eight symbols. There are more than 50 symbols in all, including images of hearts, snowflakes, dragons, and lightning bolts, as well as words such as Stop, Art, and OK. The symbols are universal in nature, allowing everyone, including young children, to participate in the family fun. Because the game requires quick mental processing, it moves fast, challenging your visual perception, memory, and matching skills. Your group of two to eight players will delight in spotting the matching symbols and agonize over getting beat to the punch by a faster player. In addition to regular game play, this game lets players choose from five individual mini-games with separate rules and objectives. Choose such contests as The Tower, The Well, Hot Potato, The Poisoned Gift, or Triplet and play them in any order. The player who wins the most mini-games becomes the champion. This card game comes with everything you'll need to play, including a convenient travel-size tin container so you can take this card game to parties or on trips.